At long last, Facebook has intervened, saving fans and investors from scheming fraudsters after verifying the official Facebook account of the Tron Foundation. With so many developments, partnership and possibly market shaping announcement, followers needed trusted sources. Facebook approval saved many from far reaching consequences of basing investment decisions on conjecture. Now that Justin and the Tron Foundation has the blue tick, cases of tricksters swindling gullible users off their hard-earned digital assets is expected to drop, increasing the platform’s reputation. On the adoption front, there are two interesting developments. One is the support of TRX at Travala. The inclusion means TRX-owning travelers can book any of the 550,000 hotels across the world without the inconvenience of FX charges. Besides, TRX settlements attract a 15 percent discount which is relatively cheaper that what traditional online hotel booking agencies charge. While at it, CoinPayments—an altcoin payment processor describing itself as a “payment gateway” for common cryptocurrencies as Bitcoin now supports BitTorrent’s BTT. So far, TRX is stable and up 2.6 percent in the last week. Regardless, the coin is trending below BTT pre-ICO levels. However, with favorable technical indicators as well as increased interests ahead of Feb 11 BTT airdrop, we expect prices to expand and even print above important resistance levels first at 3.1 cents and later 4 cents as conditions of our previous TRX/USD trade plans are met. 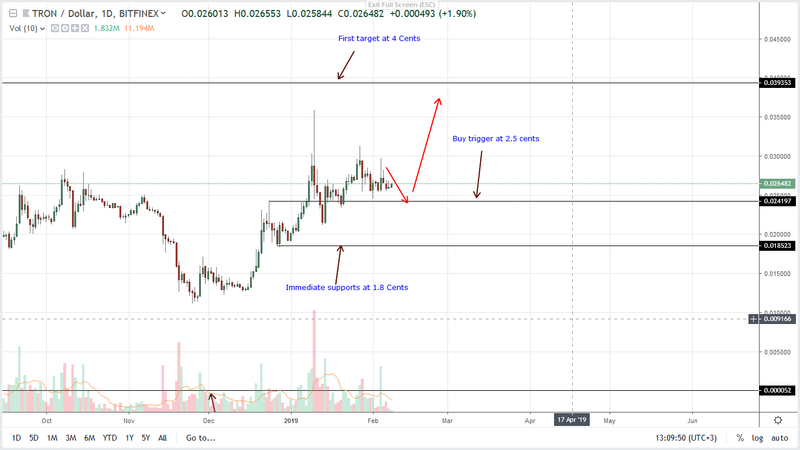 Pumped ahead of BTT ICO, TRX is up against the USD, trading within a bullish breakout pattern with clear supports at 2.5 cents. The trend is crystal and the path of least resistance is Northwards. Because of this, savvy, risk off traders should buy on dips as they fine tune entries in lower time frames with first targets at 4 cents. On the flip side, risk-averse or conservative type of traders should wait on the side lines until after prices race above 3.1 cents or the tops of the inverted hammer of Jan 27 in a bull trend resumption phase. Note that TRX/USD price action are oscillating inside Feb 6 high low. As a bull bar, we expect confirmations. That means any price surge above 3.1 cents or Feb 6 highs should be driven by high trade volumes first exceeding recent average of 15 million and 47 million of Feb 6. Only then will the odds of an uptick above 4 cents increase.